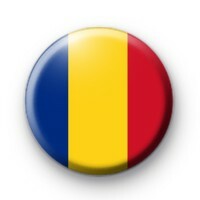 National Flag of Romania Button Badge. This brightly coloured Romanian Flag is tricolour with vertical stripes, beginning from the flagpole: blue, yellow and red. Great for sporting events, schools and of course the upcoming Football World Cup. All our badges are 25mm and handmade in Cornwall.